Ready or not, it’s 2014! Woohoo!! I’m starting off the year with a big resolution to be more organized! What a concept. Part of my plan is to blog on a regular basis. 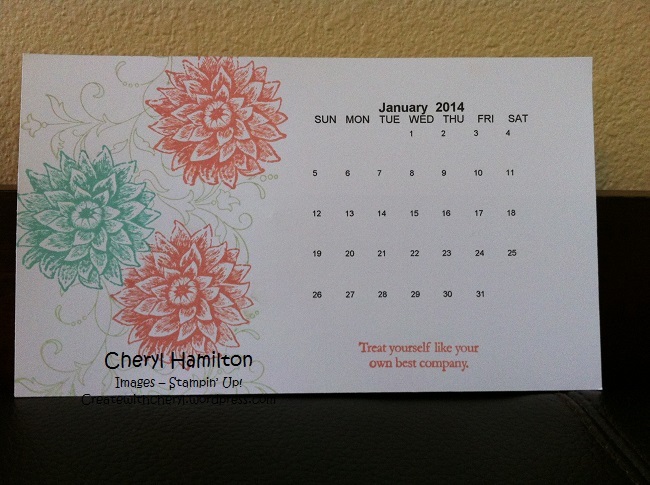 Two of my best stampin’ GF’s are helping me get started by including me in their calendar blog hop! I’ve used Creative Elements with my favorite colors: Coastal Cabana, Crisp Cantaloupe, and Pistachio Pudding. Now, for even more fun, take a look at what Crystal and Anne have done! This entry was posted in Calendars, Uncategorized and tagged Creative Elements by createwithcheryl. Bookmark the permalink. We did it! These soft colors are so comforting – what a great way to start the year.